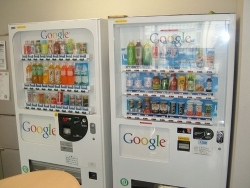 Search Engine Journal has a very cool photo of a vending machine in Google's Japan office. More photos of Loren's cool Google Japan journey are on Search Engine Journal. Are you really surprised at such a welcoming vending machine? ;) Google, after all, is the best company to work for! Previous story: Would Your Website Pass a Google Review?